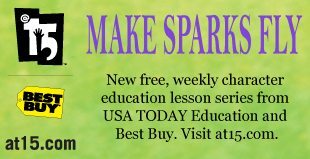 The Make Sparks Fly character education program is both user-friendly and comprehensive for teachers and engaging and relevant for students. Each week, students explore a specific theme that helps them develop their “sparks” (the abilities or interests they are most passionate about). The simple, one-page worksheets walk students through personal reflection, creative or persuasive writing, critical reading and a technology component. Every part of the lesson is student-centered and challenges them to engage in the learning process. In addition, these lessons are adaptable — they can be shortened or extended — to meet the needs of any bell schedule.